We have a wide range of Musical Accessories in the shop. Guitar Accessories include-Guitar Bags and Cases-standard,deluxe and premium with padding for extra protection. We can order in a selection of Hard cases from £61.50 to £114. Guitar accessories we supply include leads, Amps, picks, Straps, Tuners, Polish, Capos, String Winders and Strings. We sell Strings for Ukuleles,Mandolins,Bazookis,Violins,Cellos and Double Bases.Rosin and Bows for Classical stringed Instruments are also for sale.We can order in Cases for all of the above..
We sell Music stands, Instrument Stands, Drum sticks and Reeds for Saxophone and Clarinet. If there is anything musical we don't stock, we will try to get hold of it for you, if we can. This beautiful wooden music stand,folds to fit neatly under the headstock in your guitar case. Unfolding it is positively pleasurable, like solving a satisfying puzzle. It also looks good when holding your guitar . Both useful and beautiful and it smells good too! 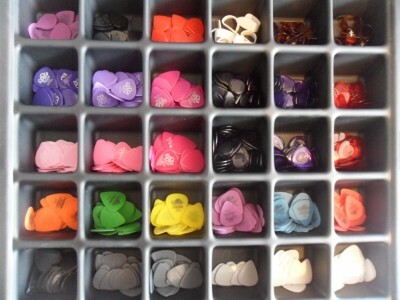 The shop sells a wide range of dunlop plectrums of all grades and thickesses . Funky metallic Purple Concert Ukulele case, custom made by Ginger Bread Safari.Purple Sequinned eding and purple Polka dot Lining-Guaranteed to turn heads! 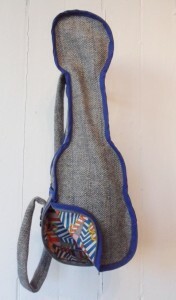 Tweed Sporano Ukulele case,custom made by Gingerbread Safari.This beautiful little case is Grey Tweed with blue edging,and with funky vintage lining-in red ,orange ,blue,grey and yellow.Shoulder strap for easy carrying.